One Saturday night about a year ago, I went out to eat at a local Chinese restaurant. 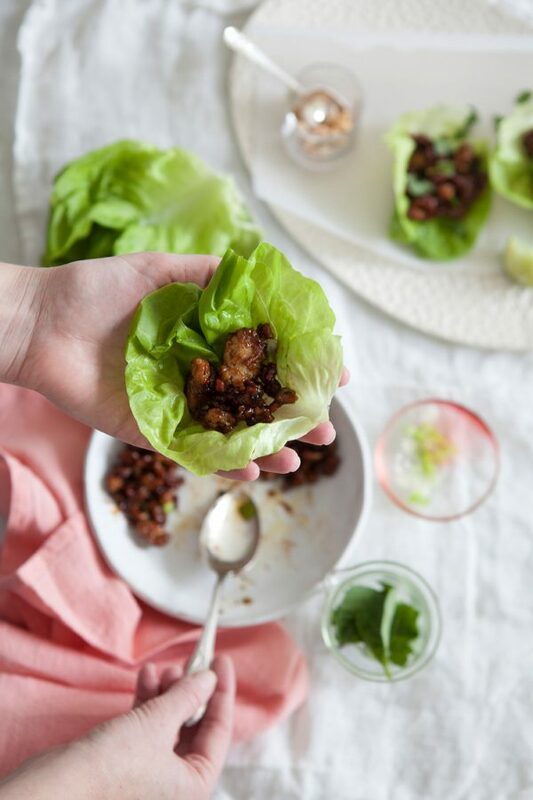 Somehow, a week later, I found myself still thinking about—still craving—the incredible chicken lettuce wraps I had. It wouldn’t be quite so remarkable if it weren’t for the facts that a.) we’re talking lettuce, and b.) no part of lettuce is cake. Naturally, I had to recreate them at home. These cashew basil wraps manage to strike a delicate balance between sweet and salty (thanks to a hoisin-soy sauce), crunchy and tender, rich and refreshing. 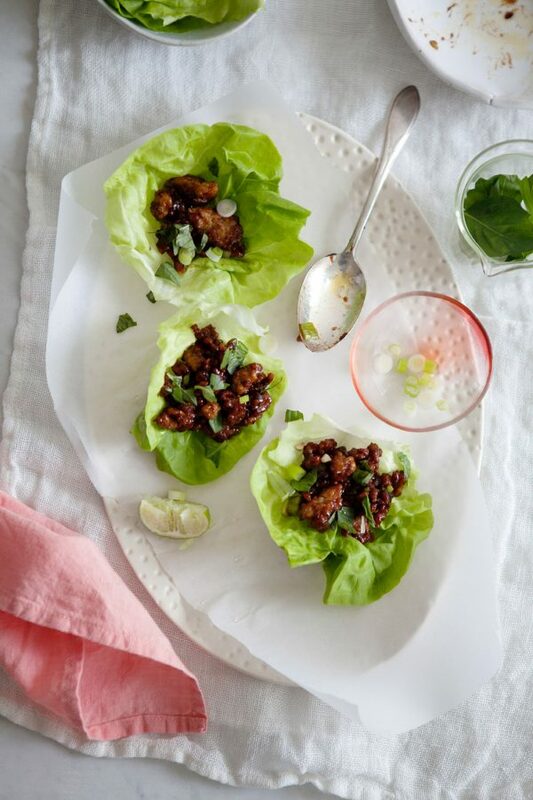 If you love cashews, love basil, and want to try the best chicken lettuce wraps around, they’re absolutely for you! There are 79 more delicious recipes in my cookbook, Eating in the Middle: A Mostly Wholesome Cookbook, and I need you to see and taste all of them! **Update** The promotion below has come to an end. Thank you all for being a part of it! If you preorder, email me at contactandiemitchell@gmail.com with either your confirmation number or a screenshot of your order, and you’ll be able to start cooking through my cookbook with me (and get immediate access to a bunch of cookbook recipes!). You’ll also be able to join me and Gina of Skinnytaste.com in our private Facebook group! Preheat the oven to 350. Spread the cashews on a baking sheet and toast until golden and fragrant, about 10 minutes. Let cool slightly and then chop the cashews. In a small bowl, whisk the chicken broth, hoisin, soy sauce, sugar, and cornstarch. In a large nonstick skillet, heat the oil over medium-high heat. Add the garlic and cook, stirring constantly, until fragrant, 30 seconds to 1 minute. Add the chicken and cook, breaking up the meat with a spatula, until browned, 4 to 6 minutes. Add the scallions and the hoisin sauce mixture and cook, stirring frequently, until the sauce thickens slightly, about 2 minutes. Stir in the fresh basil and cashews. I can’t wait to try this one, Andie! It sounds absolutely delicious :) Your photos made me hungry the minute I saw them! Really looking forward to your cookbook. Made this recipe tonight…Magical!!! So delicious. Ahhh thank you Lisa! I’m so glad to hear this!! I made these delicious morsels last night for a dinner party, and they were AHHmazing! I love your blog, book, and your recipes, and can’t wait to buy your cookbook. Thank you so much for being an inspiration to myself and so many others! My husband and I just gobbled these up. They were delicious! We like a little spice so I added probably a tbsp of siracha to the hoisin mixture. These were fast, easy, and tasty– a perfect weeknight meal! I don’t usually comment but I’ve been wanting to try this recipe for a while now, and I just did tonight. It was absolutely delicious! My husband and I both loved them. Thank you! Oh that’s so great!! Thank you for trying it, Jen! I love every recipe that I’ve tried in your book, but these are a mainstay in my house – we eat them at least once or twice a month. Sometimes I bulk them up a bit with mushrooms or water chestnuts, or whatever other veggie I have around. So good and filling! Fantastic recipe! We have made this several times and it is SO simple and delicious! Thank you for sharing!